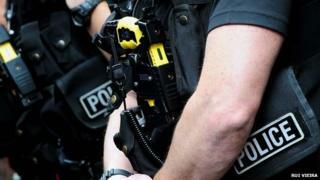 The Met is facing legal costs of several hundred thousand pounds after it "unreasonably" used a Taser on a man. Daniel Sylvester, 53, was stopped three times in nine months by police. On the second occasion, when Mr Sylvester was near his home in Edmonton Green, police used a Taser, sending him falling to the ground in agony. A jury at Central London County Court awarded him damages of £8,200 for false imprisonment and assault. He was also awarded the damages for post-traumatic stress disorder. The court heard the Met's own legal costs of defending the claim are about £150,000 and that Mr Sylvester's will come to at least £250,000. The Met would have to foot the entire bill, the judge ruled. The final figure will be determined at subsequent hearings. The Met said it was giving "serious consideration" to appealing against the decision. Earlier the court heard Mr Sylvester was stopped three times between 2007 and 2008 by heavily armed police. His car, a Mercedes 4x4, used to belong to a "violent drug-dealing gangster", the court heard. Mr Sylvester, a 29-stone (184kg) security company boss, said he was boxed in by police officers near his home who Tasered him when he got out of his car. A Taser stun gun uses a 50,000-volt charge to incapacitate its target. Mr Sylvester told the jury: "The pain was nothing like I have ever had before. It was like all your nerves and nerve endings have electricity going through. "It's like you're going to explode, all through your body, from the head to the toes. Police did not find anything during any of the searches of Mr Sylvester or the car. He sold the vehicle after he was followed and stopped a third time in Dalston. Judge Simon Freeland said the father-of-seven had been successful in "establishing the tort of false imprisonment" which he said was of "real constitutional importance and significance". He added: "The deprivation of his liberty may only have lasted for a few minutes but it was strenuously denied by the police. Mr Sylvester has established that he was assaulted. In my judgment, he has established it in a very significant way." The judge said the jury was "not satisfied" the use of the Taser was a reasonable response. Mr Sylvester said: "I'd give one of those officers my compensation if they agreed to have done to them what they did to me, to know how it feels."